2014년 JAMA 10월호에 overscreening에 대한 두 개의 논문이 실렸습니다. 두 논문 모두 타 질환으로 기대여명이 짧거나 초고령에서는 암검진 중단을 권하고 있습니다. 고령, 혹은 다른 질환으로 기대여명이 짧은 사람에서는 암검진 중단이 권고됩니다. 당연한 일입니다. 보통 10년 이상의 기대여명이 있을 때 암검진을 권하는 것이 상식입니다. 그러나 가이드라인이 잘 지켜질 것 같은 미국에서도 가이드라인은 잘 지켜지지 않고 있었습니다. 연구자들은 사망위험에 따라 암검진의 비율이 어떠한지, 즉 기대여명이 짧은 사람에서 얼마나 암검진이 이루어지고 있는지를 분석하였습니다. 9년 사망 위험은 NHIS 자료에 기초하였습니다 (A validated mortality index based on NHIS data,with a C statistic of0.75,wasused tocalculate 9-year mortality risk for each participant. Schonberg 2011). 결과는 실망스러웠습니다. 기대여명이 짧은 사람에서도 암검진이 흔히 시행되고 있었기 때문입니다. 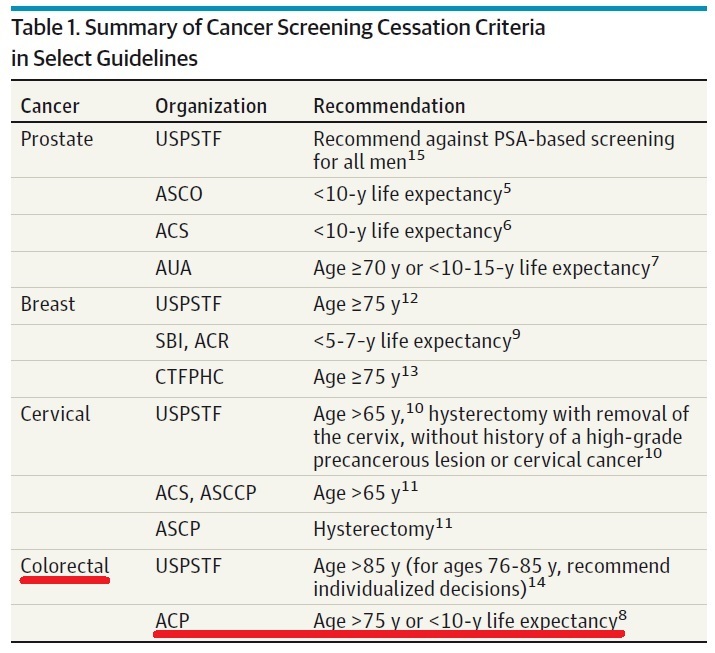 CONCLUSION: A substantial proportion of the US population with limited life expectancy received prostate, breast, cervical, and colorectal cancer screening that is unlikely to provide net benefit. These results suggest that overscreening is common in both men and women, which not only increases health care expenditure but can lead to net patient harm. 대장내시경 검사에는 반드시 일정 수준의 합병증이 발생합니다. 출혈, 천공, 사망 등이 모두 가능합니다. 합병증 발생률은 아래 modeling 그림과 같이 나이에 따라 증가합니다. 연구자들은 modeling을 통하여 대장내시경 검사간격을 단축하거나 75세 이후에 검사를 계속하였을 때 득이 있는지 검토하였습니다. 결과는 예상한 그대로였습니다. 저자는 가이드라인보다 대장내시경 검사간격을 단축시키거나 75세 이후에도 검사하는 관행은 중단되어야 한다고 주장하고 있습니다. 검사 간격을 단축한다고, 75세 이상까지 검사한다고 더 오래 사는 것은 아니었습니다. 검사 간격을 단축하거나 75세 이상까지 검사하면 합병증은 뚜렷하게 증가되었습니다. 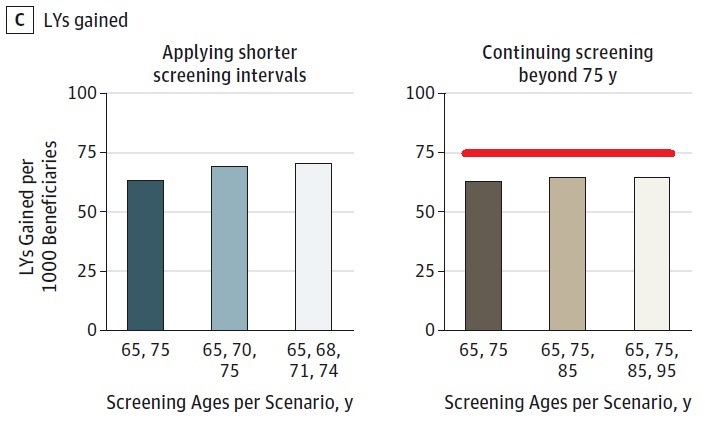 CONCLUSION: Screening Medicare beneficiaries more intensively than recommended is not only inefficient from a societal perspective; often it is also unfavorable for those being screened. This study provides evidence and a clear rationale for clinicians and policy makers to actively discourage this practice. JAMA 10월호에 실린 두 논문은 미국 의학계에서 큰 반향을 일으키고 있는 모양입니다. 미국 소화기학회에서 내고 있는 GI & Hepatology News에서는 Unnecessary cancer screening 'substantial' in U.S.라는 제목의 기사를 headline news로 뽑았습니다. 일부를 옮깁니다. 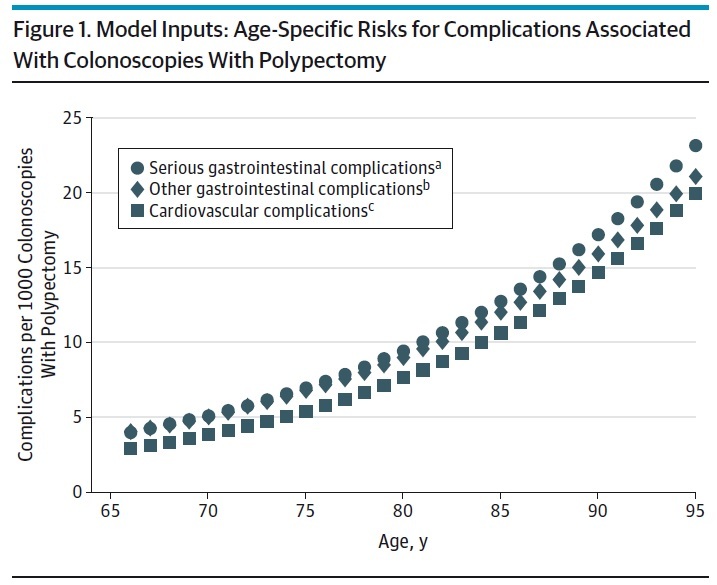 A substantial proportion of older adults in the United States undergo unnecessary and even harmful screening for colon, prostate, breast, and cervical cancer, contrary to clear guidelines that are widely recognized and well publicized, according to two separate studies published online Aug. 18 in JAMA Internal Medicine. 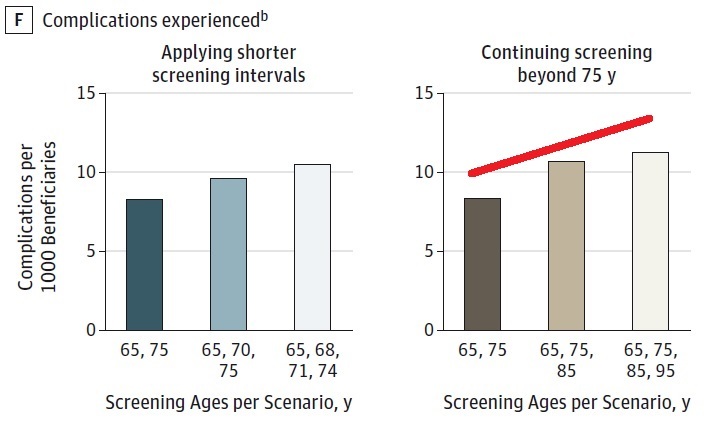 In the case of colon cancer, most of these unnecessary screenings can be attributed to patients getting rescreened more frequently than at the 10-year intervals recommended and continued screening past the age of 75 years is also a culprit. With the other cancers, the main reason for these unnecessary procedures is continuing screening in patients who have a short life expectancy because of advanced age or irreversible health problems. 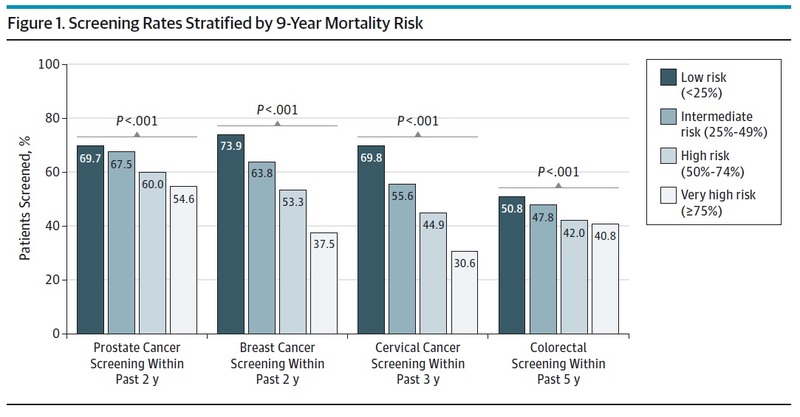 In both reports, the investigators emphasized that unnecessary cancer screening is not only inefficient and expensive from a societal perspective but is also harmful for individual patients because it exposes them to invasive procedures and complications, impairs their quality of life, and sometimes leads to downstream overdiagnosis and overtreatment of cancers that would have remained asymptomatic until the patient died of other causes. (...) Chief among these obstacles is the lack of a simple, reliable tool for assessing life expectancy in clinical practice. In addition, physicians may find it difficult to communicate to patients that they are very likely to die within the next few years, and patients may find it difficult to accept that they have a limited life expectancy or that cancer screening is no longer warranted for them. Physicians’ fear of litigation further contributes to overscreening. 우리나라에서는 언제 overscreening 문제가 논의될 수 있을지 답답할 따름입니다.